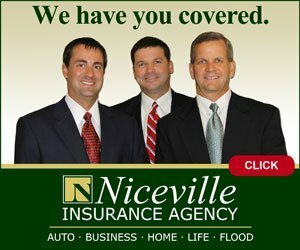 Spring Fam Jam in Niceville features live bands, children’s activities, food & drink, a one-mile Color Run, arts and crafts vendors, and more family fun. 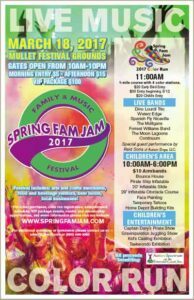 Spring Fam Jam 2017, a day-long family and music festival, is coming to the Mullet Festival Grounds in Niceville on Saturday, March 18. The event benefits Autism Spectrum on the Emerald Coast. Gates are open 10 AM to 10 PM. The cost of admission is $5 before 3 PM (ages 13+); $15 after 3 PM (ages 13+). Children aged 12 and under are admitted free. 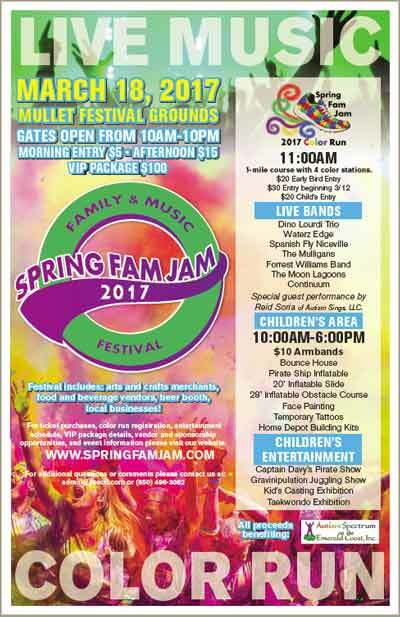 Spring Fam Jam features two stages with live bands, activities and entertainment for children, a one-mile “Color Run,” food and drink vendors, beer booth, arts and crafts merchants, disc golf competition, corn hole tournament and more. A children’s area will feature a bounce house, pirate ship inflatable, 20-foot inflatable slide, 28-foot inflatable obstacle course, face painting, temporary tattoos, Home Depot building kits, Captain Davy’s Pirate Show, Gravinipulation Juggling Show, kid’s casting exhibition, and Taekwondo Exhibition. Hours are 10 AM to 6 PM. Children’s Area armbands are $10 each. The Color Run is a one-mile course with four color stations where runners are blasted with color (wear a white t-shirt!). It begins at 11 AM. The cost to enter is $20 in advance (through March 11); $30 beginning March 12; $20 for children. Entertainment includes Dino Lourdi Trio, Waterz Edge, Spanish Fly Niceville, The Mulligans, Forrest Williams Band, The Moon Lagoons, Continuum, and a special guest performance by Reid Soria of Autism Sings, LLC. Spring Fam Jam is the premier fundraising and community awareness event for Autism Spectrum of the Emerald Coast. For more information, to register for the Color Run or to purchase tickets, visit www.springfamjam.com.